Following the retirement of Cruachan III, a three-year-old Shetland pony has stepped into his horseshoes. At the recent homecoming parade of 1SCOTS in Edinburgh, thousands of people lined the streets of the capital in glorious sunshine. They enjoyed the sounds of the military band and the pipes and drums, witnessed the pomp and ceremony of the occasion, and met a rather cute new recruit. 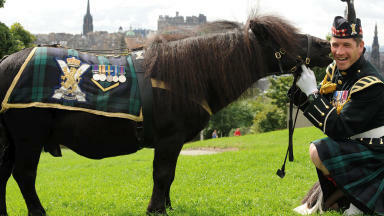 Cruachan IV, a three-year-old Shetland pony, was taking part in his first outing as the new mascot for the Royal Regiment of Scotland. Cruachan IV is currently being trained up for ceremonial duties under the watchful eye of pony major Corporal Mark Wilkinson and his predecessor, Cruachan III, who has been retired from service after reaching the grand old age of 23. The latest Cruachan has a lot to live up to. Cruachan III is a favourite of the Queen, with the monarch requesting to see the animal when Her Royal Highness is in Scotland. STV was invited to Redford Barracks to meet Corporal Wilkinson and two animals to find out what it takes to be a ceremonial pony. “I come in the morning and give them some breakfast of a few carrots and apples,” said Corporal Wilkinson. “I will then take them on a walk. 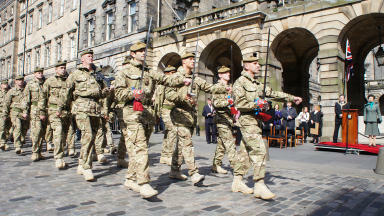 Cruachan IV came into the service of the Royal Regiment of Scotland last October. When not enjoying himself in a large grass enclosure on the barracks, he is in a ceremonial jacket and belt and has his hoofs painted black with polish. 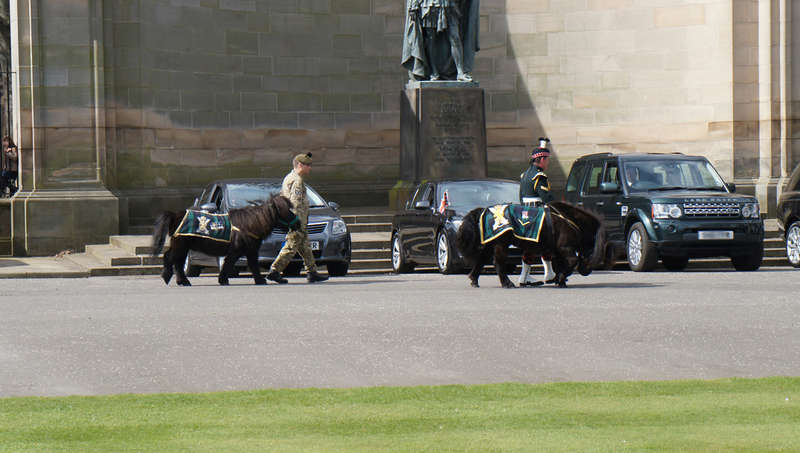 The pony even has two medals, one for the regiment’s service in Afghanistan and the other for the Queen’s Diamond Jubilee. As part of his training, Cruachan IV is learning to be around many of the elements you would expect to find on a military parade. Corporal Wilkinson said: “He is feisty - he is a kid. He just wants to play and run around and do things. “He needs to be on the move constantly. Overall, he is turning into a cracking pony. “Spooking him so far are crowds, kids, and the pipes and drums. He doesn’t like the pipes. He is not too fond of them. He kicks up. Over time, he will come through that. 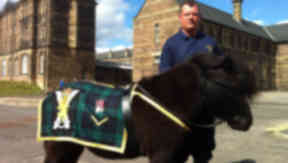 The history of the Shetland pony as a mascot in the Scottish army dates back to 1929, after Princess Louise presented Cruachan I to the Argyll and Sutherland Highlanders. When the Argylls became the fifth battalion of the Royal Regiment of Scotland, Cruachan - who takes his name from the mountain Ben Cruachan - became the mascot for the whole regiment. Corporal Wilkinson added: “It is a long-standing tradition and it is good to see it carry on to the Royal Regiment of Scotland as a whole. “The public think he is a beautiful pony. The soldiers are worse than the kids; you see a battle-hardened 30-year-old lads wanting to see Cruachan. “We are going to start working with a few people from outside in civilian life, spending a few days and working on behavioural problems to see if there is anything underlying there that we can possibly iron out. “Hopefully, by the (Edinburgh) Tattoo, he will be nice and presentable. Cruachan IV is currently preparing for a number of ceremonies and events in the next few months, including a trip to Dumfries. Over time, Cruachan IV will learn to deal with the screams of joyous children or the sound of the bagpipes. He will also become a picture of calm during the military parade - as long as you remember to keep your Polo Mints in your pocket.